With Simple Mobile Tools apps, you can enjoy a lightweight Android experience on your smartphone. Android is all about choices. If you are looking for a specific app, such as an app launcher, you will surely find yourself scrolling into an endless list of available apps in the Play Store. Each app is designed following some special principles, some are putting responsiveness on top, others are struggling for a featureful experience. During the last years, we have evidenced apps growing more and more in size, as a result of added functionality. A good Internet messaging app, for example, should be able to send and receive both text and media files, but also support voice and video calling. All these features come bundled in a single APK file, which usually weights tens of MBs. However, large apps require better performing hardware. It did not take long for developers to realize that not all currently produced Android devices can handle big apps easily. We all find ourselves being part of conversations with users complaining about some app that slows down their device. As a result, nowadays there is an ongoing tradition to choose simpler and easier to use apps for our smartphones. Lightweight Apps help create an uncluttered and responsive experience and allow users to truly increase their productivity. It is not a coincidence that giants like Facebook have invested money and time into creating lighter versions of most of their apps. We should also mention the Google Go project, which targets less-capable devices. Go project also adopts the principle of simpler and lighter apps. All apps are written in Kotlin language, which Google recently recognized as an official Android language. They try to make minimal use of system resources, while also providing basic functionality. Their user interface tries to be clean and follows the Material Design guidelines. 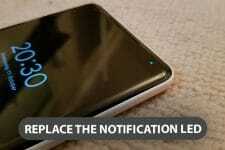 Moreover, they require no weird permissions and contain no Ads or Malicious code of any kind. All of them come as Open Source software and their code is available for everyone to read and modify on Github. Below, we will make a quick introduction to currently available Simple Mobile Tools apps that serve all specific tasks and are yet very lightweight and simple.. This Gallery app includes its own video player, so it can display both images and videos. It packages everything you would ask from a Gallery app: It offers a share button and a camera button. 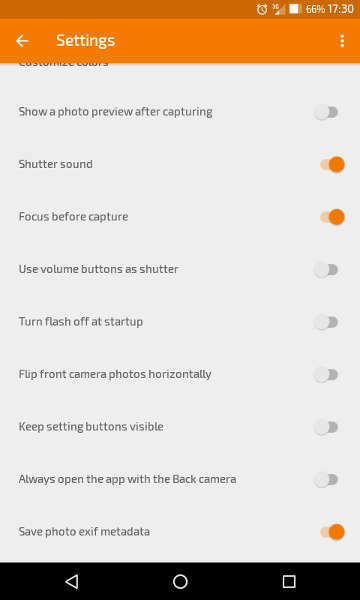 It can rotate screen based on system’s or user’s custom preference. Also, it can display media both in grid and list modes. There are 4 different application themes available, but application colors are fully customizable. 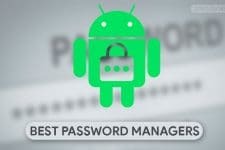 Lastly, there is support for password-protecting files. Its memory usage shouldn’t be more than a couple of MBs. Simple Calendar is an easy-to-use calendar app alternative. It offers weekly, monthly and yearly views and it can sync with CalDAV. You can also import/export calendar events from/to .ics files. As with the Gallery app, application colors are fully customizable. 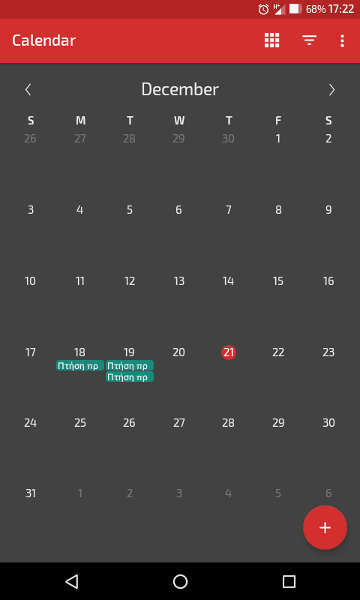 A basic calendar widget offering event list and monthly views come packaged with Simple Calendar. Capture resolutions can be changed on the fly. 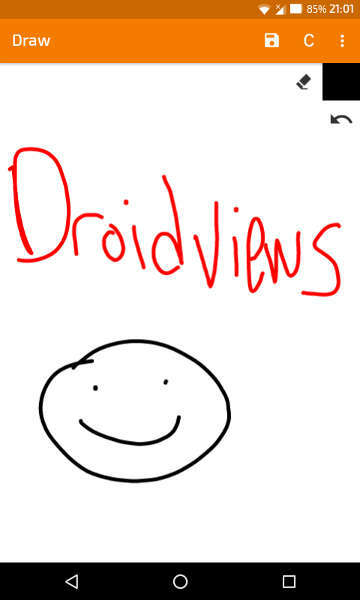 Don’t expect any special features though, as this is not meant to be a professional camera app. Memory usage is around 3 MB at most. Simple File Manager manages to provide extended capabilities while still being lightweight. It can show files on both internal and external storage and can also act as a root explorer when enabled under its settings. 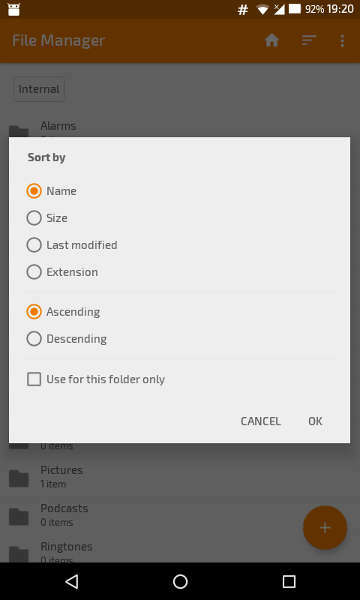 Folder contents are displayed in a list view, which provides preview thumbnails for media files. Multiple file selection, moving, copying and compressing/decompressing files are also available out of the box. Furthermore, files can be sorted by name, modification date, size, and extension. This is a Torch app with some neat features like bright display and stroboscope support. 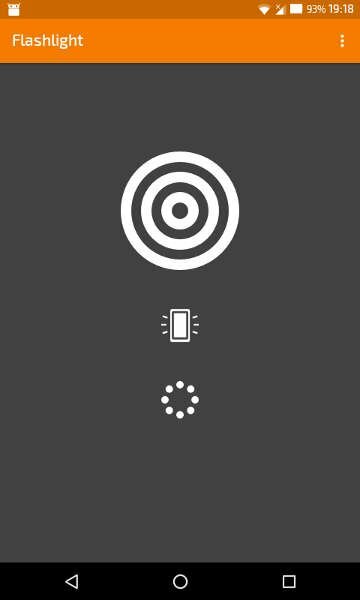 There is also a simple one-button torch widget available for the home screen. 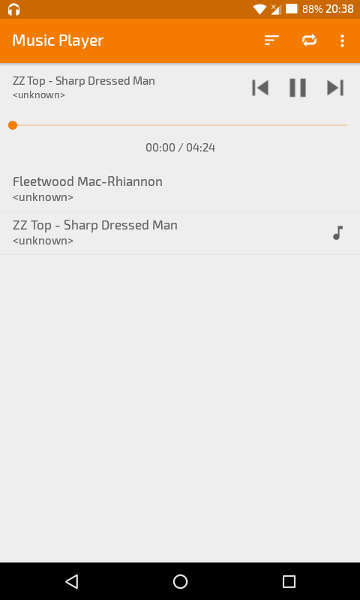 Simple Music Player will just play your music with minimal resource usage. No special features are available except shuffle, autoplay and playlist support. There is also an equalizer, with some predefined modes. A simple notification allows changing and pausing/resuming audio tracks. This player also packages a music widget, with customizable background and font colors. It uses the Android Media Framework for playback, so it should support all music formats natively supported by the device. Simple Calculator acts as a text area where you can place things you need not forget. It is designed so it has no complicated setup steps. 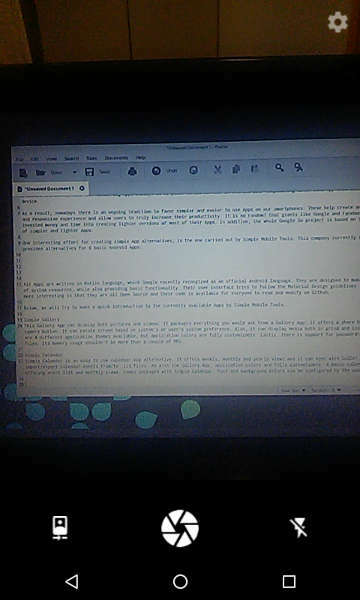 Moreover, it comes with an autosave feature, so notes are not discarded by mistake. For quick note access, a widget makes opening the app one click away. No cloud saving support or any other special feature is available. 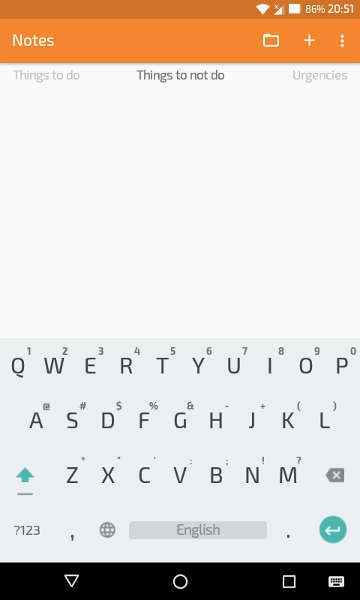 Notes are displayed by titles in a bar at the top of the app and can be accessed by sliding left or right. Text size and justification are customizable, as application theme colors. Links and emails can also be made clickable. Simple Draw is just a canvas you can draw using different colors. You can save or share your creations through social networks or email. 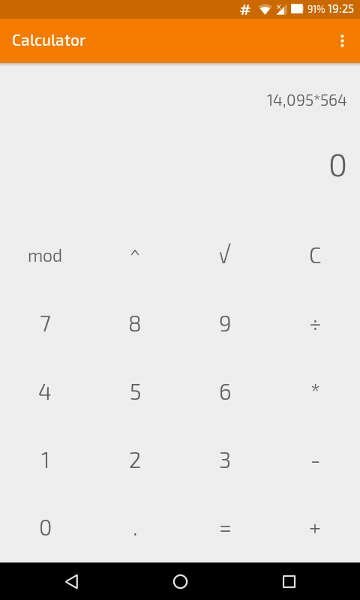 This calculator is a part of the Simple Mobile Tools apps and it does basic math calculations for you. It supports calculating square root and powers of numbers. Resource usage is minimal. 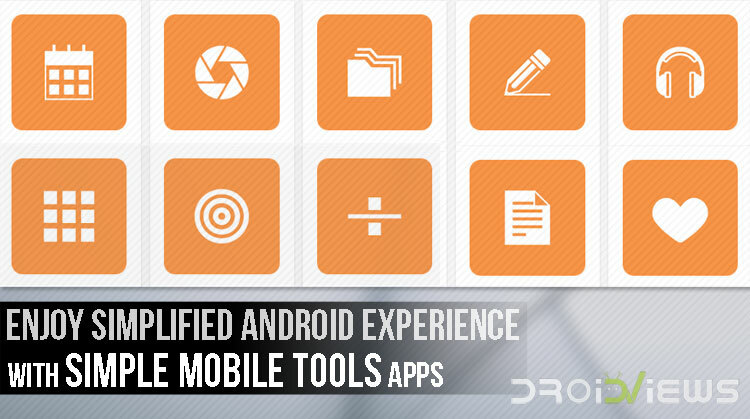 You can find all apps from Simple Mobile Tools on the Google Play Store (you can use the links provided above). If you are not a Google Services user or your device does not support Google Services, you can also find these apps in the F-Droid Repository. Lastly, if you like the apps introduced above, you can support the developer by buying the Simple Thank Youapp from the Play Store.